It's a misnomer to even call this a B western, RKO having spent to point of graduation past Saturday status ($95,000 the final cost). I wouldn't be surprised if Wagon Train was sold in select territories as a special. 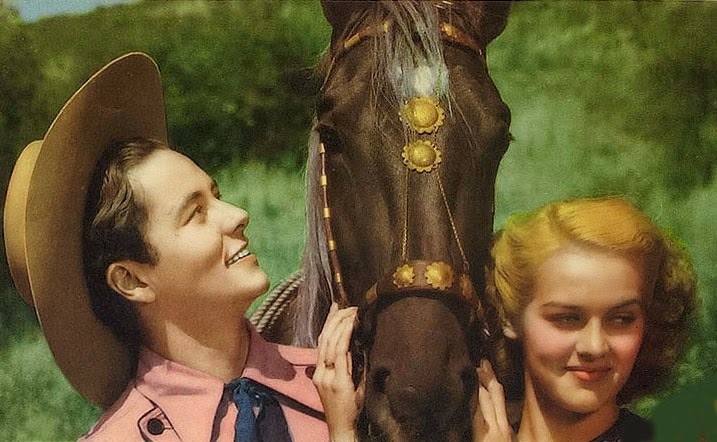 $95K was way past investments to follow on Tim Holt's new series, Wagon Train the first and clearly impression-maker for ones to come. Tim was a relative kid (21) here, being sold as a cowboy romancer and hopeful catnip to femmes. Was he the device to widen gender interest in oaters? Wagon Train wound up in a negative column ($12,000 lost), but RKO probably figured on that going in. The idea was to establish a new outdoor star, and do so on first class terms. Locations were splendidly chosen, parts shot in Kanab, Utah among imposing rocks and desert. Tim's a trailmaster warding off Apaches and food hoarding settlers. A post-massacre scene is strong meat, ingénue Martha O' Driscoll cracking up over carnage she's seen. Much here is close to the bone for matinee expectation, '40 kids flattered, I'll bet, for RKO's stronger dose than what Republic and others were then handing out. Holt was attuned from a start with dialogue, no awkwardness there, and he'd only get better with time. Hardly a wonder his phone rang frequent with offers to support in A's for the majors. 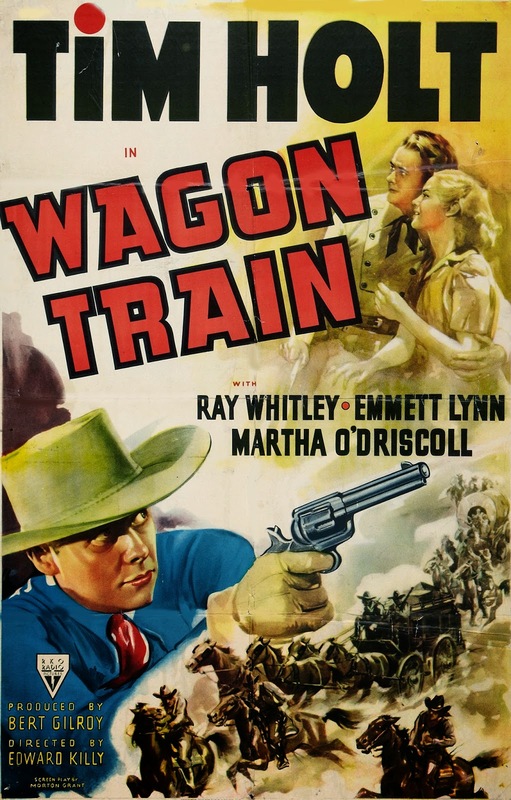 Many of his for RKO are out from Warner Archive, including Wagon Train. The Tim Holts as a group rank at the tip-top of series westerns. A year after this, Tim's father Jack was slapping mugs around with alarming vitality in the serial "Holt of the Secret Service." Since he was pretending to be a criminal, it was okay for him to be a lot meaner than the usual hero (and many villains) in fight scenes. During his A-list days, Jack merited a caricature as the referee in "Mickey's Polo Team". Was Tim promoted as Jack Holt's son? Tim's sister Jennifer had a bit of a film career herself.